9 PM: We'd just said, "I guess the horses aren't coming down for their evening meal." I'd just tossed hay to the separated 2 mares and Stormy, when I looked west and saw this BIG cloud of dust which stopped me in my tracks. 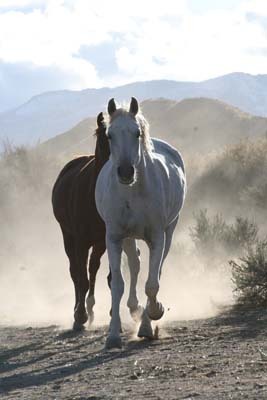 And out of the dust emerges a FLYING horse, Jose, and out of the thickening dust, the rest of the herd behind. They were 4-legged bullets, faster than any racehorse. They were hurtling so fast, I stood transfixed, with wide eyes and dropped jaw and a bit of a cringe, as they rocketed down toward the house. "Jeez-us!" I couldn't watch, but I couldn't peel my eyes away. 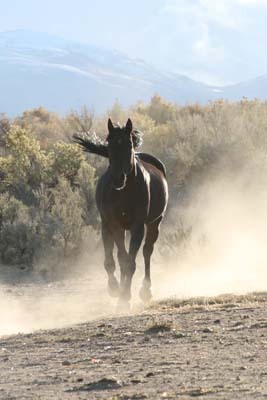 Heads up, tails whipping, legs a blur, running insanely fast, a glorious sight, silhouetted by the last of the golden sunlight and dust. They didn't brake at all and instead diverted around the hay barn, sprinting on a very narrow path by a fence past the mares and Stormy, crashing through the trees, then ripping down into and across the rocky creek, running full blast up the pasture across the creek, making a loop, and tearing full bore back toward the creek and across it, making straight for the fences where I stood. 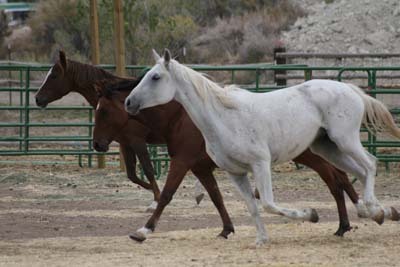 I screeched again verbally as they screeched to a halt physically, sliding stops more athletic than any reining horse, roll backs quicker than any cutting horse. They couldn't just stand still so they ran in a few more circles, tossing their heads, bucking, kicking at each other, then coming to a stop at the fence, looking for their grain. Steph thought maybe a cougar scared them up the canyon, but Diego came cantering in after them all - missing the whole shebang, and seemingly unconcerned about it. I think they did it for the sheer fun of it, with Jose the Social Director leading them all the way.